Sunday, May 6, members of the international church Iglesia ni Cristo (INC) for their annual Worldwide Walk to Fight Poverty. The event involved all of INC’s 7,000 local congregations and missions in 143 countries and territories. In the Philippines, the church’s members gathered at around six in the morning at the Cultural Center of the Philippines (CCP) in Pasay City. The 1.6 kilometer charity walk then proceeded to march along Roxas Boulevard at Rizal Park, Manila. This is what the massive crowd looked like. This year’s walk will be benefiting victims of supertyphoon Yolanda, the strongest tropical storm recorded in history, and the less fortunate in selected communities in Africa. Other than charity, though, this great big walk has another agenda: break several Guinness World Records with one event. Here’s all five records the INC tried to break. Largest charity walk in a single venue. 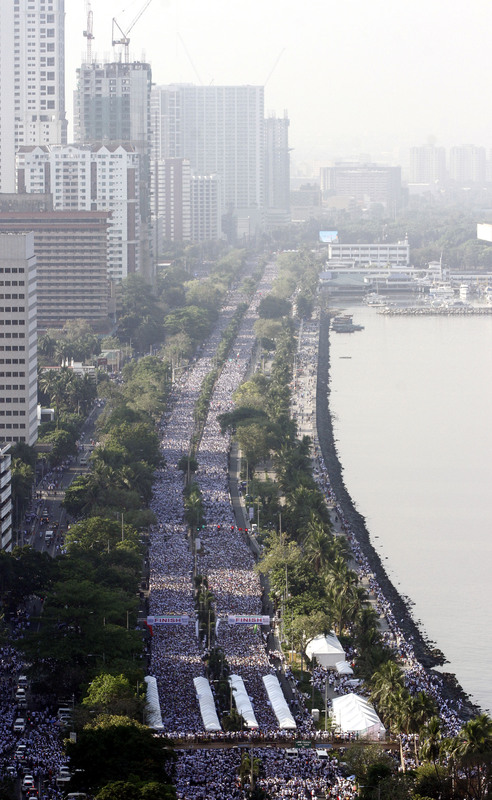 The total number of people that marched along Roxas Boulevard built up to 1.2 million. Largest charity walk in multiple venues. Talk about being competitive. The church tried to beat its own record set in 2014 with a total of 519,221 participants from 129 sites in 16 countries across the world during the first Worldwide Walk to Poverty. Forming the largest human sentence. The INC broke the record for forming the sentence “Proud to be a member of the Iglesia Ni Cristo,” with 23,235 INC members participating. The previous record holder was India who set the record in 2016 when it formed the human sentence “You can, you will,” with 16,550 participants. Largest picture mosaic formed by people. They tried to beat the record for largest mosaic formed by people by forming a flag at the Quirino Grandstand, Manila. Most nationalities in a charity walk. INC’s memberships consist of 133 ethnic groups and nationalities, with all of their congregations participating, they had a real chance at breaking the record. Still, no report whether they succeeded or not.